JFH News: Dr. Michael A. Milton Reveals "The Secret Life of a Pastor"
Dr. Michael A. Milton will release The Secret Life of a Pastor from Christian Focus Publications on April 20, 2015. 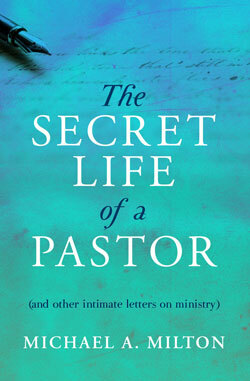 CHARLOTTE, N.C. (April 15, 2015) - Author and theologian Dr. Michael A. Milton pulls back the curtain on what it is really like to work in fulltime ministry in his upcoming book, The Secret Life of a Pastor (and other intimate letters on ministry). This warm and conversational, 128-page book releases in trade paperback on April 20, 2015 from Scotland-based Christian Focus Publications. "As an educator, I believe in the power of teaching and learning through personal mentoring," says Milton. "Things are, indeed, sometimes best 'caught' rather than taught. This book is about seeking to teach a new generation of pastors and teachers through personal letters on various aspects of life and ministry. As I wrote (to real pastoral students), I realized that what we have to teach is not only for pastors and their families, but is, really, for all of us. In this we welcome others to eavesdrop on our pastoral conversations to discover the lessons in living that God has for all of us." While both seasoned pastors and those just entering the ministry quite rightly have big hopes for what can be done, Milton knows firsthand that life in the ministry often involves dealing with discouragement and disappointment when those dreams shatter. As a pastor and seminarian himself, Milton has a real heart for those who are beginning that work of Christian service, and his heart is revealed in the brief, honest, penetrating letters that are collected in The Secret Life of a Pastor. Pastors who are just starting out, and the rest of us who we seek to serve Christ in our daily lives, will find Milton's warm insight and encouragement to be like apples of gold in silver settings. "Here is a modern version of C. H. Spurgeon's Lectures To My Students," declares Paul Kooistra, president of Erskine College and Seminary. "Mike's letters are warm, thoughtful, and practical. They should be read by every pastor, those studying for ministry, and those who care for ministers." For more information about Milton, visit michaelmilton.org. Dr. Michael A. Milton is the founder and current President and CEO of Faith for Living, Inc. and the teaching pastor of the Truth That Transforms with Dr. Michael Milton TV program on the NRB Network. He is also President and Senior Fellow of the D. James Kennedy Institute for Christ and Culture (DJK Institute). Formerly the Chancellor and CEO of Reformed Theological Seminary (RTS), Milton is an ordained Presbyterian (PCA) pastor as well as a professor. Milton earned his Ph.D. in theology from The University of Wales and holds multiple degrees from such respected institutions as Knox Theological Seminary and MidAmerica Nazarene University, and is a graduate of historic national defense institutions such as the Eisenhower Command and General Staff College and the Defense Language Institute. Milton's unique, and yet pastoral, insights and commentaries on faith and culture have been warmly received, and his columns have appeared in newspapers and publications across the nation and around the world. The multi-talented author, theologian and television personality is also a talented musician who has received rave reviews for his current CD, Through the Open Door. Christianitytoday.com, who has compared Milton to Neil Young, Steve Curtis Chapman and Dan Fogelberg, calls the music, "musically opulent and emotionally stirring." Milton has released 21 books, four CDs and writes for numerous popular and scholarly periodicals. He is a faculty member of the Intercollegiate Studies Institute and a contributing writer for The Center for Vision and Values. He was appointed to the College of Military Preachers, serves as a Chaplain in the U.S. Army Reserve (currently on active dutry) and is an instructor at the Armed Forces Chaplain School. But anyone who has listened to his music can attest that "stuffy" is not a word that is found in his vocabulary. Much like his friend and sometimes musical collaborator, legendary Christian singer/songwriter Michael Card ("El Shaddai"), Milton has an uncanny ability to unpack complex theological concepts into everyday language that makes them both memorable and accessible. In addition to Secret Life of a Pastor, Milton's recent book releases include Journey of A Lifetime, Silent No More, Songs in the Night: How God Transforms Our Pain to Praise, Sounding the Depths and the third edition of What God Starts, God Completes: Help and Hope for Hurting People. For more information on Michael Milton, visit michaelmilton.org.